I’ve experienced something the last few days that I haven’t experienced for quite some time – bone chilling cold – and I love it! I can remember Autumns in Melbourne that were so cold that a jacket, scarf, hat and gloves would barely keep you warm. It’s not like we get snow here, but we used to get an Autumn and Winter. However, the last few years have been dominated by really warm Springs, long, hot Summers followed by a brief cooling down for Autumn and Winter. Before you know it Spring has arrived with Summer hot on its heels. While I love Summer, and really enjoy feeling the heat of the Sun warm my body, I yearn for the cold. I yearn for seasons. I want my Spring, Summer, Autumn and especially my Winter. It’s what we used to have in Melbourne and it’s what we’re having now. I’ll enjoy it while it lasts because sadly, I think global warming is having its effect and my sunburnt country is going to get hotter and hotter. What better way to enjoy a cold Autumn night than with a hot coffee and a fortune! Add the water to the Turkish coffee pot, making sure you do not overfill the pot. The water should be just under the narrowest part of the rim. Spoon Turkish coffee on top of the water. Do not stir. Heat over medium-low heat until warm. Stir the coffee and sugar until they dissolve. Continue heating until the water comes almost to the boil and bubbles begin to appear on the surface. Remove from the heat and allow the bubbles to subside. Return to the heat and repeat two more times. There should now be a good layer of foam on the top. 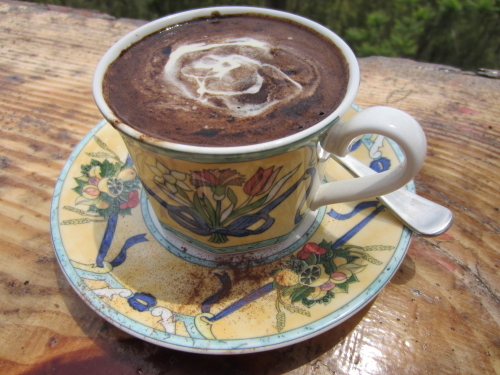 Carefully pour the coffee into two Turkish coffee cups, making sure there is foam on the top of both of them. Allow to settle for a minute before drinking. For fortune telling purposes drink from only one side of the cup. When the coffee is finished, place the saucer on top of the cup. Hold the cup at chest level and turn in a clockwise circle three times. Quickly turn the cup upside down on the saucer and leave to stand for a few minutes. Remove the cup from the saucer and turn upright. When the reading is finished and the cup returned to you, you can then make a wish whilst using your index finger to make a fingerprint in the cup. The coffee cup can be read again to see if the wish will come true or not. Finally, the coffee patterns on the saucer can be read. There are many different views on how to make Turkish coffee, the right strength and the amount of sweetness. The above recipe is my preferred way. Sometimes, for a truly indulgent – but non-traditional coffee – I float a layer of cream on top. 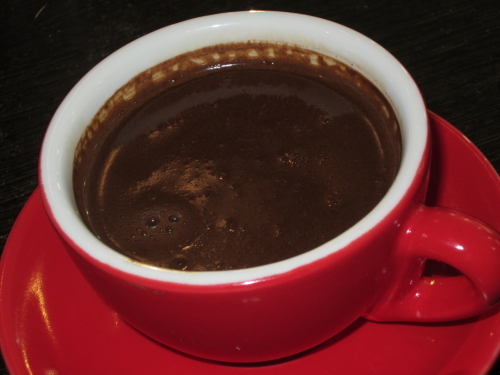 Do you have an unconventional Turkish coffee recipe/addition? Similarly there are different rituals for coffee cup reading. I’d love to hear what your traditions are. Love the Turkish coffee cup and saucer set where did you get them from? I wish I owned that set!! The coffee pictured is actually from a great place called The Polish Place. Thanks for the link looks beautiful.